Calling all Tom Petty fans! Tom Petty and Me - My Rock n' Roll Adventures with Tom Petty written by Jon Scott and published by CB Publishing. 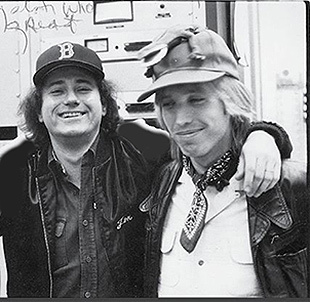 A Division of Chickasaw Buddy, Inc. is a fast-paced all-around interesting read with funny and touching stories about his friendship of over 40 years with Tom Petty and is filled with great photos of Tom Petty and his band. Read and rock on! American singer, songwriter, musician Tom Petty (October 20, 1950 - October 2, 2017) left a lasting legacy of memorable songs he wrote for his band, Tom Petty and the Heartbreakers, as a solo performer, and as part of The Traveling Wilburys (Tom Petty, Bob Dylan, George Harrison, Rob Orbison, and Jeff Lynne), however his career might not have taken off without the persistence of "promo" man Jon Scott. An interesting note is that when Tom Petty and the Heartbreakers released their album by the same name on the Shelter label at ABC Records in 1976, the album almost tanked. Eight months after it was released it had received limited air play on the west coast in San Francisco and on the east coast in Boston, and ABC Records was ready to pull the plug on the band. This was the album that gave us such memorable songs as Breakdown and American Girl. The reason for the limited air play? The album cover featured a surly Tom Petty wearing a black leather jacket and a bandolier (bullet belt) slung across his chest and radio stations took one look at the cover and thought that it was a punk rock band and said, no way, we don't play punk rock music. Although Tom Petty and the Heartbreakers were a rock band, not a punk rock band, the album cover was deceiving and thus received no air play, that it is until Jon Scott joined ABC Records as a "promo" man. For those unfamiliar with the term "promo" man, it is someone who works at a record label and works with the label's artists to get them air play, media coverage, and provide promotion for the bands. When Jon Scott first heard the Tom Petty and the Heartbreakers album he was blown away. His boss told him that the album had already been out for 8 months and was going no where. Jon so firmly convinced that this band was the real deal he asked if he could dedicate 6 weeks to getting them noticed and get them air play. So confident that this was a band to be reckoned with, he told his boss that if he could not do this in 6 weeks, the studio could fire him. After 8 months of limited air play, they thought okay,what's another 6 weeks. Hard work, knocking on a lot of doors, and calling on prior radio station contacts, he succeeded, and thus was the start of his lasting friendship working with Tom Petty and the Heartbreakers. From a shaky beginning in 1976 to winning several prestigious Grammy awards, Billboard Music Awards, MTV Video Music Awards, and Radio Music Awards, in addition to numerous award nominations, Tom Petty and the Heartbreakers well lived up to Jon Scott's expectations and so much more. As for Tom Petty's lasting musical legacy I was at a restaurant in Portland, Maine in October 2018 with my husband, Edward, my sister Joanne and her husband Peter, and when the band kicked into a cover of American Girl, we rushed to the dance floor to dance with wild abandon to a song on an album that almost never made it. I for one, am very glad that it did. A prolific songwriter, a few of the many great songs Tom Petty wrote include: American Girl, Breakdown, Learning to Fly, Runnin' Down A Dream, Into the Great Wide Open, You Don't Know How It Feels, Don't Come Around Here No More, Mary Jane's Last Dance, and the long list goes. Tom Petty will definitely be missed, but thanks to Jon Scott, his stories and adventures will live on in the book, Tom Petty and Me - My Rock n' Roll Adventures with Tom Petty. 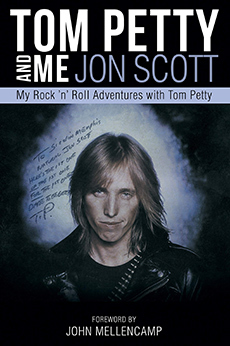 Tom Petty and Me - My Rock n' Roll Adventures with Tom Petty by Jon Scott is published by CB Publishing. A Division of Chickasaw Buddy, Inc. and is available as a paperback. ISBN: 978-0-692-09119-7. "Jon Scott was born in Memphis, TN. Following his dreams, he became a DJ in 1967 at America's most powerful rock station, WMC-FM 100. In 1974, he realized another dream and went to work for MCA records as a promo man. The very first record that he was given to promote was from a band called Mudcrutch; a single named "Depot Street". Jon liked what he heard and got the record played at a station in Nashville. However, the label dropped Mudcrutch at that time and Jon moved on to do promotions for artists such as Lynyrd Skynyrd, The Who, Elton John, Steely Dan, John Mellencamp, Billy Thorpe, Jimmy Buffett and many others. Along the way, he moved to ABC Records, where he met Tom Petty. Coincidentally, Tom had started out in Mudcrutch. The coincidences and serendipity with Tom and Jon did not end there as a series of events occurred that altered the careers of Jon as well as Tom Petty and the Heartbreakers." CB Publishing. A Division of Chickasaw Buddy, Inc.